I'm a sucker for the How to Train Your Dragon movies with Hiccup and his Night-fury dragon, Toothless, and a whole host of recurring characters voiced by a plethora of recognisable actors from Gerard Butler and Cate Blanchett to Kit Harrington and David Tennant. This is the third outing for Hiccup and co. This time Hiccup's Viking settlement is overrun by the dragons they've rescued and they are attracting the attention of dragon catchers and, in particular, dragon hunter, Grimmel, who speciales in killing Night-furies. Hiccup is now the leader of their small but expanding community and he has an understanding with Astrid (but they aren't married yet). He's desperately trying to shoulder the burden of leadership alone. 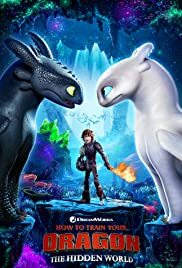 As the dragon population increases and the bad guys get closer, Hiccup dreams of finding the Hidden World his father talked about, where humans and dragons will be safe together, but he has some tough choices to make as Toothless falls in love, and things change. It's a sweet story with some nail biting action and tense moments which lead to a satisfying resolution. The moral of the tale? We are stronger together. As usual the animation is superb. This whole franchise is particularly noted for having an amputee hero who grows past his disability and never lets it slow him down. Great for children and pretty darn good for adults as well.